As a tiny acorn can eventually lead to much bigger things, so has the seed of an idea I had of building a new barn to season my wood and store my forestry equipment. I have been managing two small woodlands on the edge of the High Weald AONB of East Sussex for 3 or 4 years now. 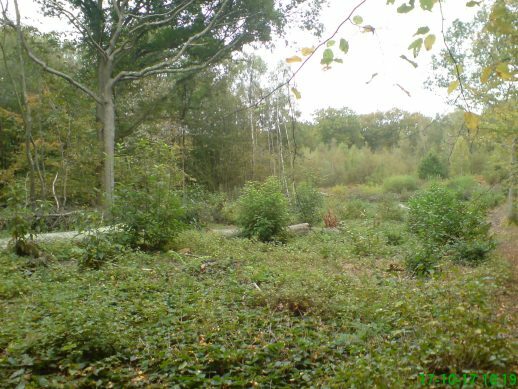 Both have been neglected and both have been in a transition from working coppice to a high canopy of crowded oak and hence a suffering understory. Combining the thinning of these oak with the construction of a new but traditionally built barn seemed to me like a bit of a virtuous circle. The trees desperately need thinning for the health of the woodlands, and I desperately need more storage space. The materials will as much as possible come from within a 10 mile radius of the site. Using building techniques that have been developed over 100’s of years will I hope, not only be very satisfying, but also provide a great opportunity to learn some new ‘old’ skills. Opening up the rides in the woodlands was my first job. Light is allowed in, neglected coppice stools are revived and dormant seeds germinate as a natural regeneration is given the best opportunity to flourish. My aim is to reduce the oak canopy to about 30% cover, in the woodlands and maybe even more on the ride edges. This means felling quite a lot of trees as in places they shade up to 90% of the woodland floor. The reason why these woodlands and most other woodlands of this kind in the country are so undermanaged is largely economic. 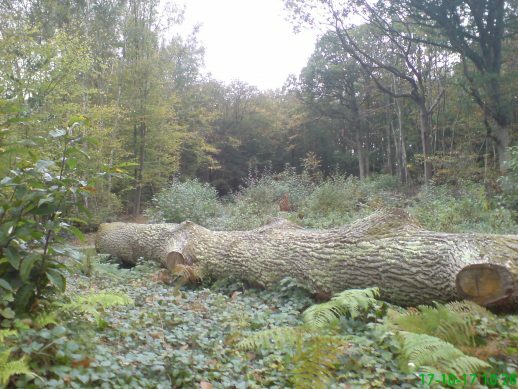 It is very difficult to make coppicing pay and even the big oak timber trees at best will only make a meager return, once the felling and transportation costs are taken into account. 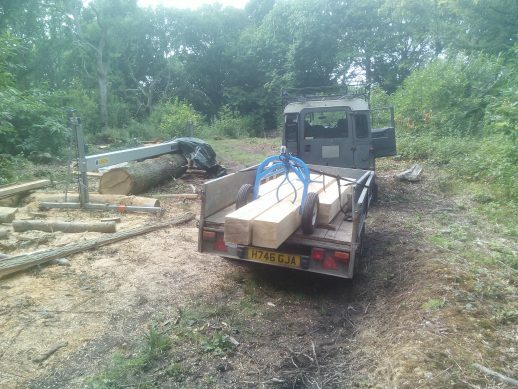 As ever, the easy to get at trees, close to a road or ride can make up a viable load for the timber mill. 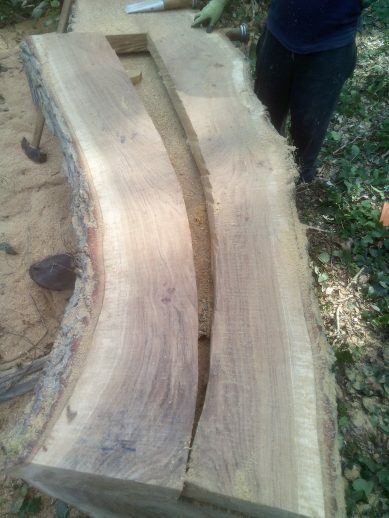 It leaves us with a wealth of good quality trees, but a difficult job in extracting them. I’ve taken a bit of a different approach. Instead of taking the tree to the mill, which entails getting in huge lifting equipment and requires hard tracks and turn-arounds. 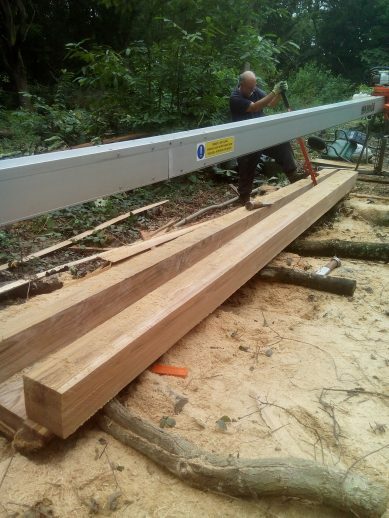 I have a lightweight portable swinging arm mill, which can be carried in by two people and built up around the felled tree. The boards or beams can usually be taken out with logging arches, gravity and sometimes skids and hand winches. All very labour intensive but considerably easier than hewing the beams by hand or being consigned to the ‘underdog’ of the saw pit! The groundwork is nearing completion, I will build on a concrete foundation and brick plinth. The rest will be as near as possible in keeping with the techniques and traditions of the oak timber framers stretching back hundreds of years and hopefully lasting for as many into the future. Check back as the building takes shape! Watch one of the first trees come over from a very precarious angle!